Taking care of your babies all day long is a tedious and tough task. You need to be constantly vigilant and careful about the baby’s safety and need to entertain them so that they don’t cry frequently. Doing all this everyday makes it tiring for the parents. 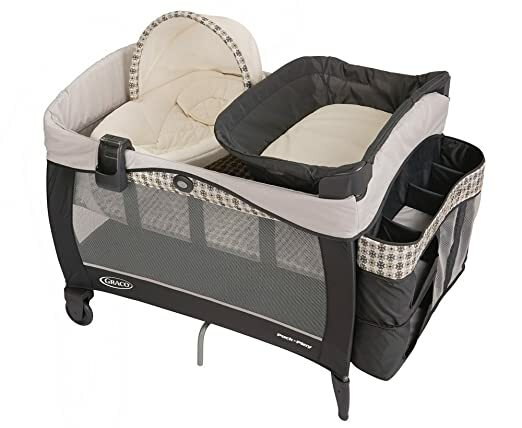 Due to the development of equipment like cribs or more advanced ones called the pack and play you can get rid of all these daily responsibilities at once without harming your baby and with added safety advantage. In this article, we shall see how you can make the best use of pack and play by utilizing its features to its best and keeping your babies safe and healthy. You as a parent would want to keep an eye on your kid for constant attention to ensure that he is safe at all time, but this is manually impossible. There are thousands of household works that you need to do to survive and during which you cannot watch your baby. Pack and play’s soft, long and strong walls keep your baby safe and will not let them fall off even if you are not paying attention to them. If you help your baby adapt to the pack and plays, you can keep them entertained by placing some attractive toys in there. Similarly, by placing certain educational toys also, you could help them adapt to the learning environment very early. This would not just help them learn at an early age but also increase their grasping power due to constant exposure to such surrounding. All the pack and play are extremely light weight and foldable too. Due to this, you can carry them wherever you want and keep your baby safe without keeping a constant watch on them. Small babies need constant watch for their safety and if they cry or face any other problems. This is not possible all the time for anyone to constantly watch the kid, but through the pack and play, this problem is solved instantly as without watching the baby, you can be rest assured of its safety and can reach him if the baby cries. In this way, you can reach out to your kid in time without really watching him all the time. The play and pack are meant for your kid to sleep comfortably being absolutely safe in it. Along with the safe sleeping bed, play and pack also serves literally as the playing ground for your babies without the need of its parents watching them constantly for their safety and comfort. People have been using cribs for a very long time and pack and plays are relatively a new concept. But even after looking at the advantages of the pack and plays, you are not convinced, the cost factor would compel you. Yes this is right, that these pack and plays are cheaper than the cribs available in the market today. Pack and plays are always of smaller sizes as compared to the cribs and are foldable. Due to this the place that it occupies when in use and its storage space are both lower as compared to the space required for the cribs. With being compact, their lightweight also helps you shift it to any place for storage and usage. As mentioned, these pack and plays also serve as the playgrounds for your young and small babies. These pack and plays give ample space for your tiny babies to move around without any danger of getting hurt or falling off, hence looking after all the safety criteria of your baby. Pack and play are the ultimate solution to your baby’s safety. It offers you a great flexibility to do your work and also keep your babies safe without the need of watching them constantly. They also offer you a great advantage of carrying them wherever you want like parks or relatives or parties, so that you can enjoy your time, but at the same time also keep your babies safe and happy. So what are you waiting for, go ahead and start looking.